There is no fundamental reason for tip speed to change with scale. However, for turbines on land, restrictions on acoustic noise emission increase as a power function to the tip speed, and so often limit how fast the tip can go. This was especially the case when turbines predominantly operated in fixed speed mode. Variable speed wind turbines have greater operational flexibility and can benefit from a high rated speed, but still operate at reduced speed (at night, for example) in noise sensitive areas. Higher tip speed has the advantage that, for a given output power, the torque on the drive train is reduced and therefore the drive train mass and cost also decrease. Offshore, there is a clear potential benefit in higher tip speeds, and less constraint on acoustic emission levels. However, with increasing tip speed, blade solidity decreases (in an optimised rotor design), and blades will tend to become more flexible. This can be beneficial for system loads but problematic for maintaining the preferred upwind attitude, with adequate tower clearance of the blade tips in extreme loading conditions. Listed data on design tip speed (Figure 3.21) shows an increase with scale, albeit with great scatter in the data. 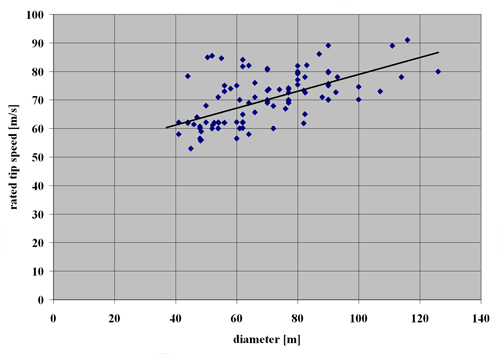 It is evident that the present ceiling is around 90 m/s but also that, to restrict tower top mass, very large offshore turbines will not adopt design tip speeds much below 80 m/s.